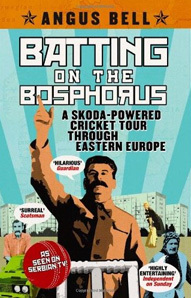 Following a chance encounter with a psychic, Angus Bell sets off on an 8,000-mile Skoda-powered road trip across Eastern Europe in search of a cricket match. It's a gloriously batty adventure which brings Bell face-to-face with fingerless fielders in the Czech Republic, Serbian MI6 agents, and the realisation that England's most eccentric game is being played with passion in the strangest corners of the continent. Angus Bell is a 27 year old, whisky-swilling Scotsman with a first class degree in English, Flying saucers and Space Studies. He has visited 40 countries, and has written for the South African Sunday Times, Inside Sport in Australia, the US Student Traveller, Cricinfo in India, and The Wisden Cricketer in the UK. He now plays cricket in Montreal, Canada, where he lives with his girlfriend Candy, and pet rabbit Usagi.